We are manufacturers, exporters and dealers of "PAT" Brand Nylon Mallets. Made from tough nylon material. Non-chipping, Non-splitting, wears resisting, waterproof, oil proof. Non-spark. 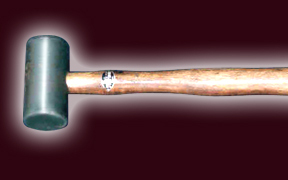 The Mallet is suitable for light hammering on wood or on thin metals. Preferred by instrument makes or model makers. Application : Sheet Metal and Automobile Industries, Gun Powder and Ordinance Factories, Mines, Aircraft Industries, Maintenance works. Quite safe because of non-spark. Recommended for use in place of Rawhide Mallet where damp conditions exist.